In recent years there has been increasing interest in using what are termed 'multiscale modeling' approaches to understand the effects of composition and microstructure on mechanical behavior of materials. It is of utmost importance that these modeling efforts and simulations at the various length scales be coupled with experimental work. 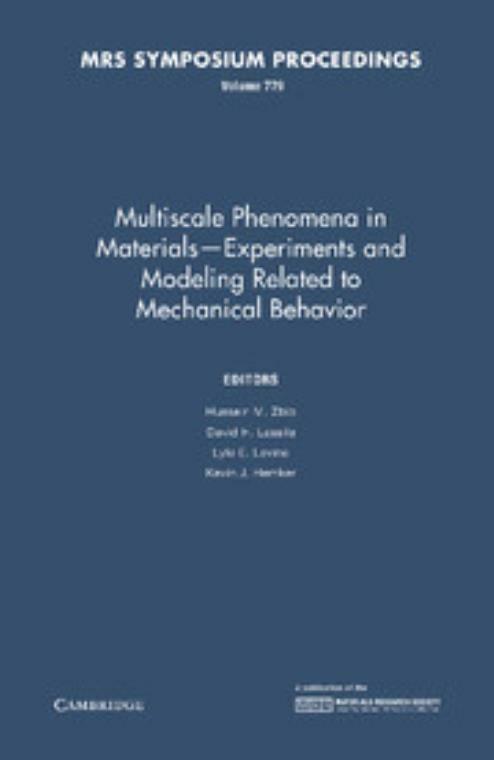 This 2003 volume focuses on experimentally validated multiscale modeling of ductile metals and alloys. The areas of atomistic, mesoscopic and continuum modeling are featured. Topics include: multiscale modeling of plastic deformation; dislocation phenomena at the atomistic-length scale; multiscale modeling of thin films and nanoindentation; multiscale modeling of dislocation phenomena and plastic deformation; multiscale modeling of microstructures and experiments; and models and experiments in nanostructured materials. 38. Aerosol deposition method (ADM) for nano-crystal ceramicscoating without firing; Author index; Subject index. Hussein M. Zbib Washington State University. David H. Lassila Lawrence Livermore National Laboratory, California. Lyle E. Levine National Institute of Standards and Technology, Maryland. Kevin J. Hemker The Johns Hopkins University.